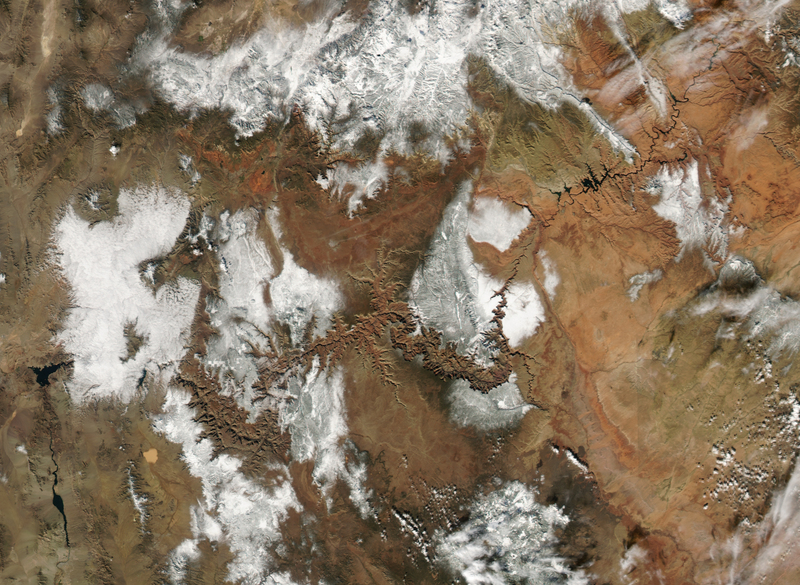 Snow across the burnt-orange rock of the Colorado Plateau makes the rugged topography of the Grand Canyon of the Colorado River leap out from the center of this image captured by the Moderate Resolution Imaging Spectroradiometer (MODIS) sensor on NASA’s Aqua satellite on November 23, 2004. 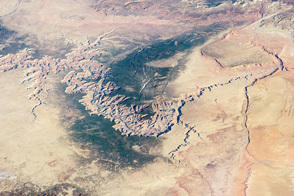 The image is cropped to show the eastern half of the canyon, starting with the section known as Marble Canyon at upper right, just downstream of Lake Powell (shown in large-format image). The upper reaches of Marble Canyon are rimmed on the west by the Vermillion Cliffs, and on the east by the Kaibito Plateau. A salmon-colored line running away from Marble Canyon across the plateau is Echo Cliffs. The snow highlights the widening of Marble Canyon as the Colorado River cuts southwestward. Just before the river makes a sharp bend to the west, the big river is joined by the Little Colorado, which appears as a tightly zigzagged line slicing through the Painted Desert, at bottom right. Farther west, a north-to-south swath of snow is broken by the widening canyon. A narrow margin of deep, olive green on the western perimeters of the snow-covered areas reveals that this area is covered by the Kaibab National Forest. West of the National Forest, two canyons join the Grand Canyon: Kanab Creek from the north and Cataract Creek from the south. The Colorado Plateau extends over parts of the “Four Corners” states: Colorado, New Mexico, Arizona (pictured here), and Utah. Different sections of the plateau have names from numerous different languages—Native American, Spanish, English—evidence of the complex cultural history of the region. 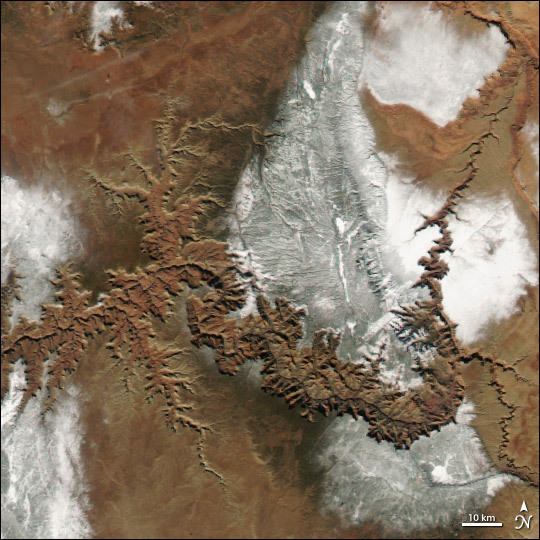 At image left, a second swath of snow spans the Uinkaret Plateau (north) and the Coconino Plateau (south). Although the event is not visible at the spatial resolution (level of detail) provided by MODIS, a major, planned flood of the Grand Canyon was occurring at the time this image was captured. Since humans constructed dams across the Colorado, the seasonal cycle that brought roaring, sediment-laden floods through the canyon each spring with the snowmelt have stopped. The sandbars and river banks that provided habitat for the canyon’s plants and animals have steadily eroded, and in the process, several species have become extinct or endangered. In 1996, scientists and engineers let loose a planned flood from the Glen Canyon Dam to try to begin rebuilding some of this habitat. A second major flood of the canyon got underway on Sunday, November 21, and lasted until Thursday, November 25. NASA image created by Jesse Allen, Earth Observatory, using data obtained from the MODIS Rapid Response team.